BACKGROUND AND PURPOSE: Epidural blood patch treatment of spontaneous intracranial hypotension arising from ventral CSF leaks can be difficult secondary to challenges in achieving ventral spread of patching material. The purpose of this study was to determine the technical success rates and safety profile of direct needle placement into the ventral epidural space via a posterior transforaminal approach. MATERIALS AND METHODS: We retrospectively reviewed consecutive CT fluoroscopy–guided epidural blood patches from June 2013 through July 2015. Cases were included if a posterior transforaminal approach was taken to place the needle directly in the ventral epidural space. Rates of technical success (defined as contrast in the spinal canal ventral epidural space) and optimal epidurogram (defined as contrast spreading into or beyond the middle third of the spinal canal ventral epidural space) were determined. Factors influencing these rates were assessed. All complications, inadvertent intravascular injections, and intrathecal punctures were recorded. RESULTS: A total of 72 ventral epidural blood patches were identified; immediate technical success was achieved in 95.8% and an optimal epidurogram in 47.2%. Needle position within the spinal canal ventral epidural space was associated with obtaining an optimal epidurogram (P = .005). Inadvertent intravascular injection was identified in 29.3% of cases, but all were venous. There were no inadvertent intrathecal punctures or complications. CONCLUSIONS: Direct needle placement in the ventral epidural space via a transforaminal approach for treatment of ventral CSF leaks has an excellent technical success rate and safety profile. This technique can be considered as a treatment option in selected patients with ventral CSF leaks for whom traditional techniques are unsuccessful. Spontaneous intracranial hypotension is thought to be the result of CSF hypovolemia, most commonly secondary to spinal CSF leaks arising from dural defects. These defects can occur in a variety of locations, including along the nerve root sleeves and the ventral dural surface (Fig 1).1⇓–3 CSF leaks arising from the ventral dural surface are difficult to treat given the considerable challenges in gaining access to this location during both surgery and imaging-guided epidural blood patching.4 Conventional imaging-guided epidural blood patch (EBP) approaches do not always result in ventral epidural spread of patching material. Improved ventral epidural spread can be achieved with alternative approaches, which could potentially result in improved efficacy for treatment of ventral CSF leaks. A 55-year-old woman with spontaneous intracranial hypotension secondary to a CSF leak. 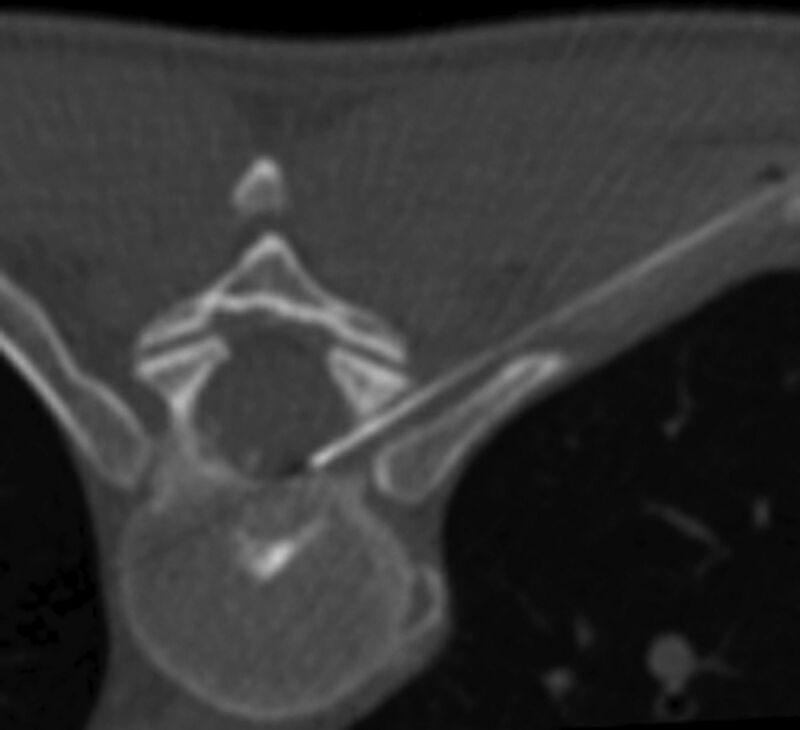 A, Postmyelogram CT at the level of the T7–8 disc interspace demonstrates a ventral CSF leak (white arrow) containing contrast with an attenuation slightly less than that of intrathecal contrast. A small spiculated osteophyte (white arrowhead) is the presumed cause for the leak. 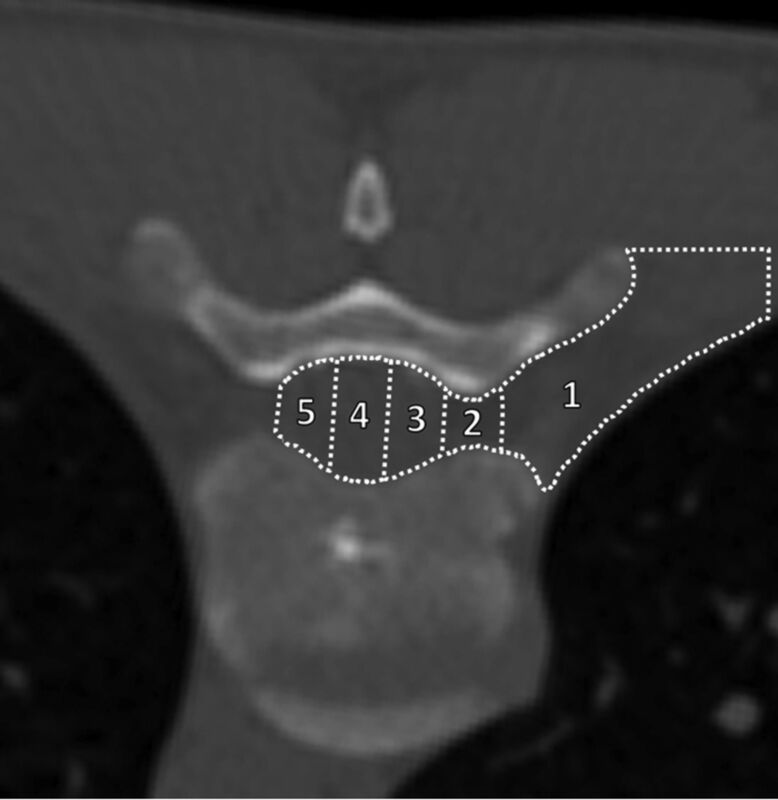 B, Lateral projection dynamic myelogram of the midthoracic spine confirms the origin of the CSF leak at T7–8. Note the split of the contrast column at this level consistent with a ventral CSF leak (white arrow). Previously described imaging-guided EBP approaches include posterior interlaminar needle placement in the dorsal epidural space of the spinal canal and transforaminal placement of the needle posterior to the spinal nerve root. Both of these methods can fail to result in ventral epidural spread of injectate.5⇓–7 Improved ventral spread can be achieved by placing the needle tip directly within the ventral epidural space (VES). A group of investigators has recognized the potential utility of this needle positioning, publishing single-case reports describing transforaminal and anterior transintervertebral disc techniques.8,9 However, no larger case series have been published evaluating the technical efficacy and safety of direct ventral EBP techniques. The purpose of this study was to determine the technical success rates and safety profile of direct needle placement into the VES via a posterior transforaminal approach. We retrospectively reviewed consecutive CT fluoroscopy–guided targeted EBPs performed on patients diagnosed with spontaneous intracranial hypotension (based on the criteria outlined by Schievink et al10) from June 2013 through July 2015. The electronic medical records and departmental procedure schedules were reviewed to identify cases. Cases were included if a posterior transforaminal approach was taken to place the needle tip directly in the VES of the neuroforamen or the spinal canal (Fig 2). All patients had imaging findings concerning for a ventral CSF leak. Data analysis was performed on a single needle placement basis (ie, if a patient underwent 2 posterior transforaminal approach VES needle placements at different locations during the same procedure, each individual needle placement would be considered a separate case). Needle-tip placement in the ipsilateral third of the spinal canal ventral epidural space via right T8–9 posterior transforaminal approach for epidural blood patch treatment of a ventral CSF leak confirmed via dynamic thoracic myelogram (not shown). All of the patient's symptoms resolved after the procedure. Our local institutional review board approved this Health Insurance Portability and Accountability Act–compliant study and granted a waiver of informed consent. All procedures were performed on the same CT fluoroscopy–equipped scanner (LightSpeed 16; GE Healthcare, Milwaukee, Wisconsin) by 1 of 3 neuroradiologists with 5, 8, or 10 years of experience performing CT-guided EBPs, respectively. The standard CT fluoroscopy–guided posterior transforaminal epidural approach was taken as previously described, but with a slight modification: for these procedures, a 22-gauge Quincke point needle (BD Medical, Franklin Lakes, New Jersey) was advanced through the neuroforamen such that the tip terminated within the VES.11,12 Once in the VES, approximately 0.2 mL of contrast material (iopamidol, Isovue-M 200; Bracco, Princeton, New Jersey) was injected to assess needle-tip position and potential spread of patching material and to exclude intravascular injection (Fig 3). Intravascular injection was excluded by using the previously described “double-tap” technique.13 After confirmation of both satisfactory needle positioning and absence of inadvertent intravascular injection, patching material (typically a total volume of 1–5 mL of autologous blood with fibrin glue [Tisseel; Baxter, Deerfield, Illinois]) was injected. Examples of successful ventral epidural spread of contrast (optimal epidurograms). A, A 48-year-old woman with a ventral CSF leak treated via left T7–8 transforaminal approach ventral patch. Contrast spreads to the contralateral third of the ventral epidural space (white arrow). B, A 41-year-old man with a ventral CSF leak treated via left T8–9 transforaminal approach ventral patch. Contrast spreads past the midline in the ventral epidural space (white arrow). C, A 54-year-old woman with a ventral CSF leak treated via left T7–8 transforaminal approach ventral patch. Contrast spreads into the middle third of the ventral epidural space (white arrow). Procedural images from the study cohort were reviewed by a board-certified radiologist with a Certificate of Added Qualification in neuroradiology and 5 years of experience performing CT fluoroscopy–guided targeted patching for spontaneous intracranial hypotension. The following information was recorded: neuroforamen level and laterality, the angle of the needle approach as measured from the long axis of the vertebral body spinous process, z-axis position of the needle within the neuroforamen (inferior third, middle third, or superior third), needle-tip location, the extent of the resultant contrast epidurogram, the presence of inadvertent intrathecal puncture or intravascular injection, and any procedural complications or adverse events. We categorized the extent of the resultant contrast epidurogram by presence of the leading edge of contrast within 1 of 5 anatomic zones: 1) extraforaminal space; 2) foraminal VES; 3) ipsilateral third of the spinal canal VES; 4) middle third of the spinal canal VES; or 5) contralateral third of the spinal canal VES (Fig 4). Immediate technical success was defined as the presence of contrast within the spinal canal VES. Technically successful procedures were further characterized as exhibiting an optimal epidurogram if contrast extended into or beyond the middle third of the spinal canal VES (Fig 3). Needle-tip position was categorized by using the same anatomic zones as for the contrast epidurogram. Classification scheme for both final needle-tip position and determining the extent of the contrast epidurogram. Example is for a right-sided transforaminal approach to the VES at T8–9. The final needle-tip position or the leading edge of the contrast epidurogram was classified as terminating within 1 of 5 zones: 1) extraforaminal space; 2) foraminal VES (defined as between the medial and lateral margins of the pedicle); 3) ipsilateral third of the spinal canal VES; 4) middle third of the spinal canal VES; or 5) contralateral third of the spinal canal VES. Inadvertent intravascular injection was classified as definitely venous, probably venous, indeterminate, probably arterial, or definitely arterial by using previously described criteria.13 An inadvertent intrathecal puncture was deemed present if contrast was identified within the thecal sac on the procedural images or if such an event was documented in the procedural report (eg, CSF return during needle placement). Patient outcomes were determined by a retrospective review of the patient's electronic medical record. A successful ventral epidural patch was defined as absence of the patient's presenting symptoms at 2 months after the procedure. Patients who received a subsequent patch within 2 months were automatically deemed treatment failures. A Mann-Whitney test was used to compare needle angles between patients with an optimal epidurogram and those without an optimal epidurogram. Two-tailed Fisher exact tests were used to assess for factors predictive of an optimal epidurogram, including needle-tip position, neuroforaminal level, and needle laterality. Two-tailed Fisher exact tests also were used to assess for factors predictive of inadvertent intravascular injection, including needle-tip position, neuroforaminal level, needle laterality, and the presence of an optimal epidurogram. A χ2 test was used to compare the incidence of inadvertent intravascular injection between different needle z-axis locations within the neuroforamen. All statistical analyses were conducted by using GraphPad Prism software (Version 6.0b; GraphPad Software, San Diego, California). Statistical significance was considered at a threshold of P < .05. A total of 1116 procedures were reviewed during the study period, and 72 ventral EBPs were identified (occurring during 39 separate procedure encounters). These ventral EBPs were performed in 35 patients, all with imaging findings concerning for a ventral CSF leak. This patient group included 25 women (71.4%) and 10 men (28.6%) with a mean age of 47.3 years (range, 15–81 years). Most cases (89%) were performed after failure of at least 1 prior conventional EBP. There were no major complications or adverse events in any patient. Most needle placements were performed in the thoracic spine (71 of 72 [98.6%]; 1 at L3–4), and there were nearly equal numbers of right- and left-sided approaches (38 and 34, respectively). Immediate technical success was achieved in 95.8% (69 of 72) of needle placements. 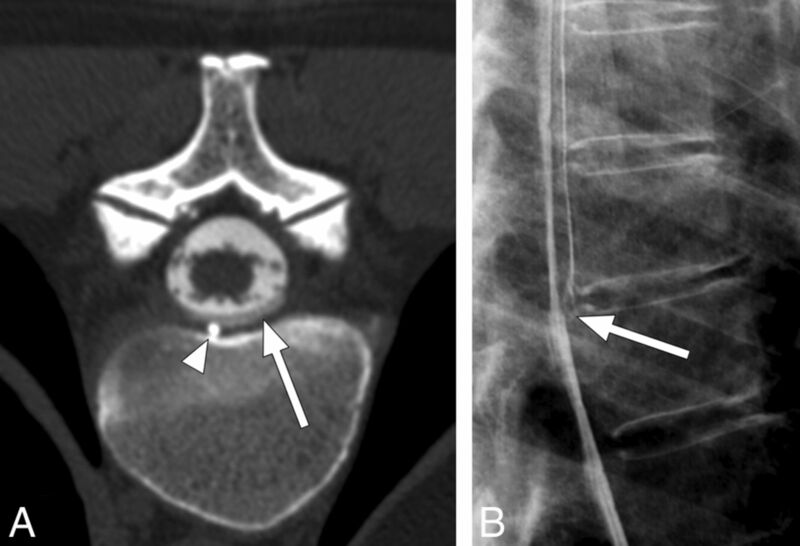 An optimal epidurogram, defined as contrast reaching or extending beyond the middle third of the spinal canal VES, was achieved in 47.2% (34 of 72) of needle placements. Contrast reached the contralateral third of the spinal canal VES in 13.9% (10 of 72) of needle placements. An optimal epidurogram was achieved more commonly when the needle tip was placed into the spinal canal VES compared with the foraminal VES (P = .005) (Table). There was a trend toward increased needle angle (indicating a shallower approach) resulting in optimal epidurograms, though this did not reach statistical significance (P = .08). Neither the side of injection nor the foraminal level was a significant predictor for achieving an optimal epidurogram (P = .16 and P = .80, respectively). Inadvertent intravascular injection during the epidurogram was identified in 29.3% (22 of 75) of needle placements, necessitating needle repositioning before injection of patching material. All cases were considered venous (13 probably venous, 9 definitely venous). None were indeterminate or considered arterial. There was no significant association between inadvertent intravascular injection and side of injection (P = 1), achieving an optimal epidurogram (P = 1), foraminal level (P = .43), or needle-tip position (P = .80). There was a significantly increased likelihood of inadvertent intravascular injection when the needle traversed the middle third of the neuroforamen in the z-axis (P = .01) (Fig 5). There were no cases of inadvertent intrathecal puncture. 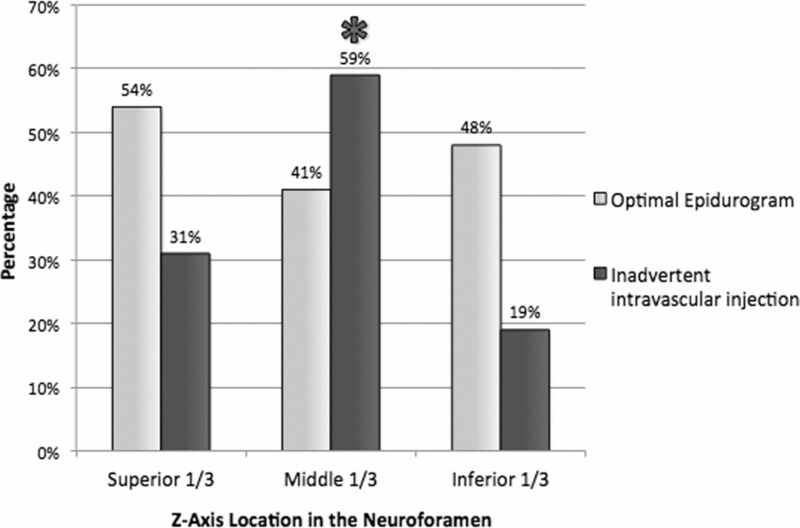 Incidence of optimal epidurogram and inadvertent intravascular injection per needle z-axis location in the neuroforamen. Asterisk indicates significant increase in inadvertent intravascular injection (P = .01). Forty-one percent (16 of 39) of ventral epidural patches resulted in successful resolution of patient symptoms for at least 2 months after the procedure. In 8 cases (21%), there was a subsequent repeat patch within 2 months of the ventral patch attempt. Thirteen patients (37%) underwent surgical repair of their CSF leak. No patients were lost to follow-up. CT fluoroscopy–guided EBP via direct needle placement in the VES by using a transforaminal approach has an excellent technical success rate. In 72 needle placements, 95.8% were technically successful, and nearly half (47.2%) resulted in an optimal epidurogram. Given these findings, we conclude that this technique can result in substantial spread of patching material throughout the ventral epidural space. Previously described methods for imaging-guided EBPs typically involve either a posterior interlaminar epidural approach or a posterior transforaminal approach, analogous to those used with corticosteroid injections.16,17 These techniques result in needle-tip placement within the dorsal epidural space of the spinal canal or the dorsal epidural space of the neuroforamen, respectively. In either case, the needle tip remains far removed from the dural defect responsible for a ventral CSF leak. Prior studies investigating the spread of epidurographic contrast by using a posterior interlaminar approach during corticosteroid injections have consistently demonstrated relatively poor spread to the VES.5,7 For example, Botwin et al5 found that only 36% of interlaminar injections resulted in ventral epidural spread despite using 5 mL of contrast (significantly more than used in this study). Prior studies of transforaminal approaches have demonstrated slightly better rates of success, ranging from 61.4%–88%.6,18,19 However, it is important to note that in all of these studies, “ventral” was defined as the anterior aspect of the neuroforamen. This was because the investigators were interested in the efficacy of corticosteroid injections for nerve origin pain. Furthermore, these investigations all involved procedures guided by conventional fluoroscopy, which limited their ability to assess for contrast spread into the spinal canal VES rather than simply the neuroforaminal VES. Therefore, it is impossible to know what percentage of these cases would be considered as either technically successful or optimal epidurograms according to the metrics defined in our study; presumably, it would be considerably less than the percentages previously reported. Achieving contrast spread into the spinal canal VES is important when treating a ventral CSF leak because an inability to deliver patching material to the site of the dural tear will preclude successful treatment. Importantly, there were no complications in any of our cases. A potential risk of this procedure might include injection into a radiculomedullary artery, given the transforaminal approach used. Transforaminal epidural needle placement, performed during corticosteroid injections for pain, has been associated with rare but serious reported complications, including paralysis, stroke, and death.20⇓⇓⇓–24 These events are thought to be the result of either embolic injection into, or direct vascular injury to, a radiculomedullary artery supplying the spinal cord. Embolic injection is the more likely mechanism, considering that no catastrophic events have been reported with nonparticulate corticosteroids.25 We performed 72 needle placements without a complication. Furthermore, we found no cases of intra-arterial contrast injection. We did identify an inadvertent intravascular injection rate of 29.3%, which is slightly higher than the reported rates in the literature for posterior interlaminar and transforaminal needle placements.13,26⇓–28 The rich epidural venous plexus within the spinal canal is presumably responsible for the relatively increased incidence of vascular cannulation in our study. The fact that all of these incidents were classified as either “definitely venous” or “probably venous” supports this supposition. We recommend an approach through the inferior third of the neuroforamen, where possible, for 2 reasons. First, there was a relatively increased incidence of inadvertent venous injection when the needle traversed the middle third of the foramen. Second, a radiculomedullary artery will usually be located anterior to the nerve root within the superior third of the neuroforamen within the thoracic spine.29,30 Therefore, an inferior approach will help to avoid it. Of course, any potential risk associated with placement of a needle in the ventral epidural space via a posterior transforaminal approach should be considered in the context of the available alternative treatment options. For patients with ventral CSF leaks that have failed conventional treatments, it is often the case that the sole remaining option is a complex and challenging surgical intervention with significant morbidity and potential mortality. In limited case reports, prior investigators have recognized the potential benefit of direct, targeted placement of patching material within the ventral epidural space. Park and Villablanca8 published a single-case report of an anterior approach through the C5–6 intervertebral disc under conventional fluoroscopic guidance. This anterior needle approach courses between the pretracheal fascia and the carotid sheath and is commonly used during cervical discography and disc biopsy.31 Given the presence of the mediastinal structures and the lungs, this technique would not be feasible in the thoracic spine, which is where most ventral CSF leaks occur. Furthermore, the technique is not without significant risk because of the need to displace the carotid artery as well as avoid the vertebral artery. In fact, multiple complications have been previously reported, including hemorrhage, vertebral artery injury, damage to the spinal cord, and injury to the trachea and carotid artery.32 Zaw et al9 reported a single case of successful epidural blood patch achieved by placement of the needle tip in a ventral epidural collection at T6 via a posterior transforaminal approach. This procedure was performed after several failed conventional blood patch attempts. Similarly, most of our cases also were performed after failure to achieve a durable treatment with more conventional methods. Our study is the first to investigate this transforaminal approach to the ventral epidural space in a large series of patients. Furthermore, it includes new information about the extent of ventral epidural spread of patching material and provides insight into the safety profile of this approach. There are several limitations to our investigation. First, this was a retrospective study of a relatively limited number of procedures performed by highly experienced interventionalists. We recommend caution for proceduralists with limited experience. In addition, rare complications could have been missed given the number of patients. However, 72 consecutive needle placements without a complication suggests that the incidence of such adverse events is likely very low. Second, we did not perform a direct comparison of the contrast epidurograms achieved by using conventional CT fluoroscopy–guided patching methods (ie, interlaminar and traditional transforaminal approaches) with the experimental technique outlined in this manuscript. There might be a different and more efficacious mechanism for achieving an optimal epidurogram in the VES. However, prior studies suggested that conventional interlaminar and transforaminal approaches under fluoroscopic guidance do not result in adequate spread to the ventral epidural space of the spinal canal.5⇓–7,18,33 Finally, though we noted that 41% of patches resulted in successful resolution of patient symptoms for at least 2 months, prospective patient outcomes were not assessed in this investigation. A more structured evaluation with validated headache outcome measures could be included in a future prospective investigation. Furthermore, a study comparing patient outcomes for interlaminar epidural, transforaminal epidural, and ventral epidural approaches is needed to justify more widespread adoption of this technique in patients with ventral CSF leaks. This study confirms that direct needle placement in the VES via a transforaminal approach for treatment of ventral CSF leaks has an excellent technical success rate. Furthermore, it demonstrates an acceptable risk profile given the absence of complications in 72 consecutive needle placements. This technique can be considered as a treatment option in selected patients with ventral CSF leaks for whom traditional techniques are unsuccessful. Further prospective studies comparing patient outcomes when using this technique with those for alternative treatments of ventral CSF leaks are warranted. Accepted after revision April 22, 2016.